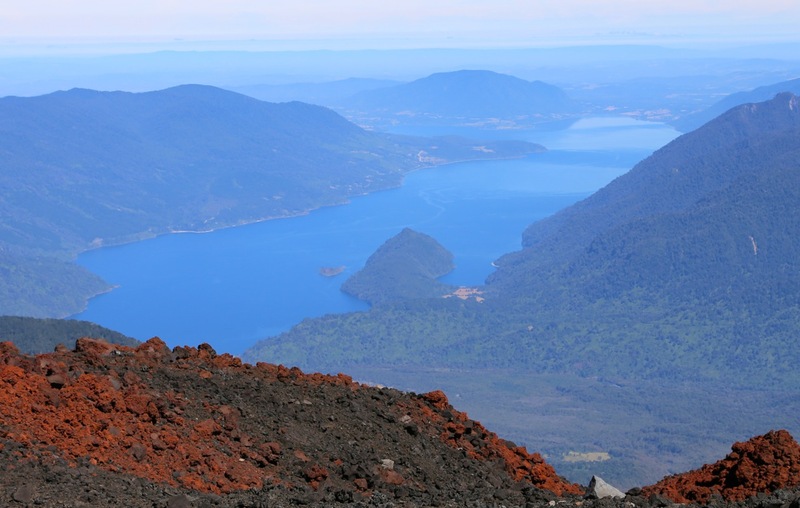 A good place of reference is the town of Panguipulli at the north end of lago Panguipulli. 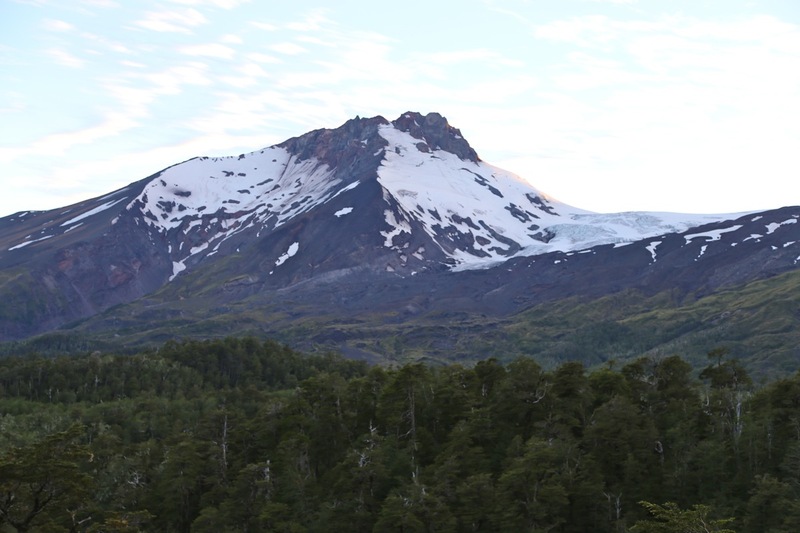 from here, drive about 50 kilometer south-east on Chile Hwy. 203, (along the NE side of the lake) to Choshuenco. Continue 11 kilometer on a good dirt road to near the SE end of lago Rinihue. Turn left and drive another 13 kilometer along a dirt road that (currently) only is suitable for a high clearance 4WD vehicle. Several men with machines and trucks were working on this road when we drove it, it is possible that the quality may improve in the future. The road descends to the valley floor and crosses the river. 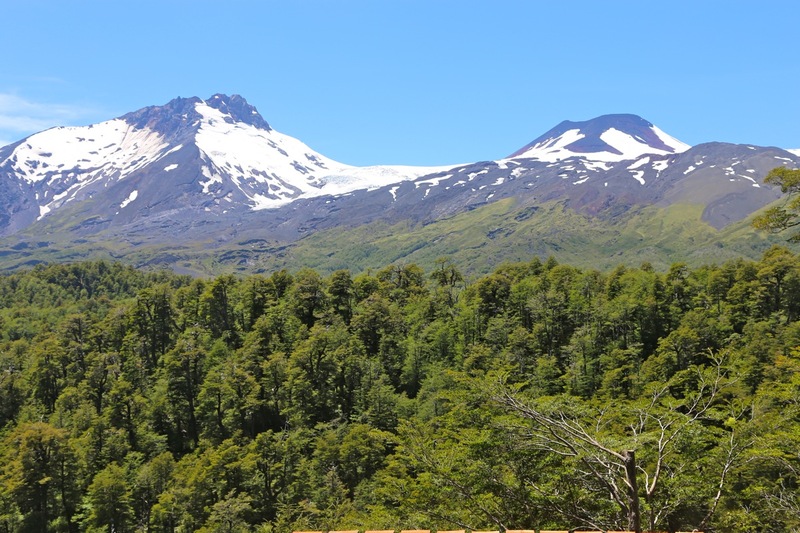 You get a good view of the twin summits, Choshuenco and El Mocho, from a turnout while descending into this valley. Choshuenco dominates and looks higher, perhaps fortunately, this is not the case. This location is at S39.93702, W072.09586, elevation about 1015 meter. The Conaf station is directly uphill from this bridge. A 4WD may continue up a somewhat steepish hill to the Conaf station, then be permitted to continue several kilomter to the end of the road. (Location S39.94674, W72.06391, elevation about 1475 meter.) The road does not get appreciably worse beyond the Conaf building. An alternative is to park near the bridge and include the final section of this road in the mountain hike. If one drives to the end of the road, then this climb is one of the easiest among the Chile volcanos, the remaining section of the climb required 2.5 hours round-trip when we were there. Starting from the Conaf station, continue to walk along the road. The first part is quite flat and runs in forest. Later, the road emerges from the forest and makes its way up a grassy hill. Just before the end of the road, at a short final flat section, there is a wooden pole on the left side. Somewhere here, cross left towards a large ravine and locate a small, but clear trail that runs near the steeper slope. 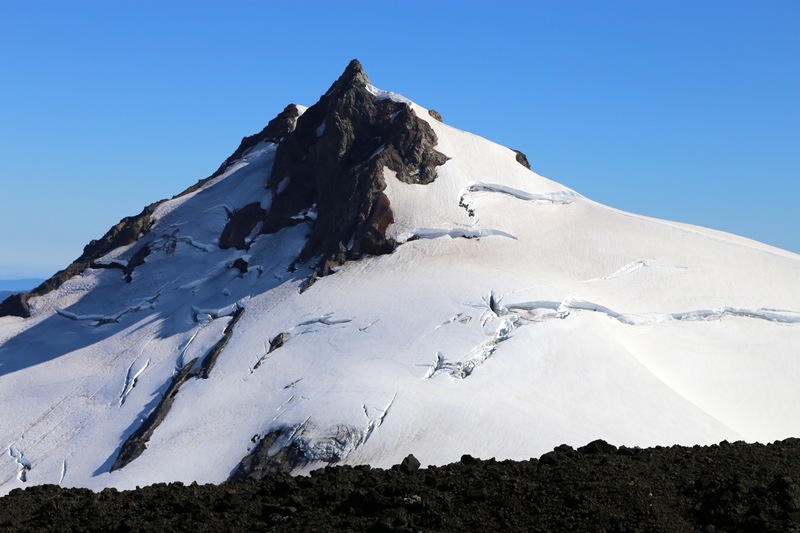 This trail will gradually enter the more distinct moraine ridge and follow this to the beginning of a gentle snow slope at location S39.94418, W072.05306, elevation about 1660 meter. Continue up on easy snow, in order to stay on snow all the way to the local horizon, the line of ascent will shift slightly left as viewed uphill. 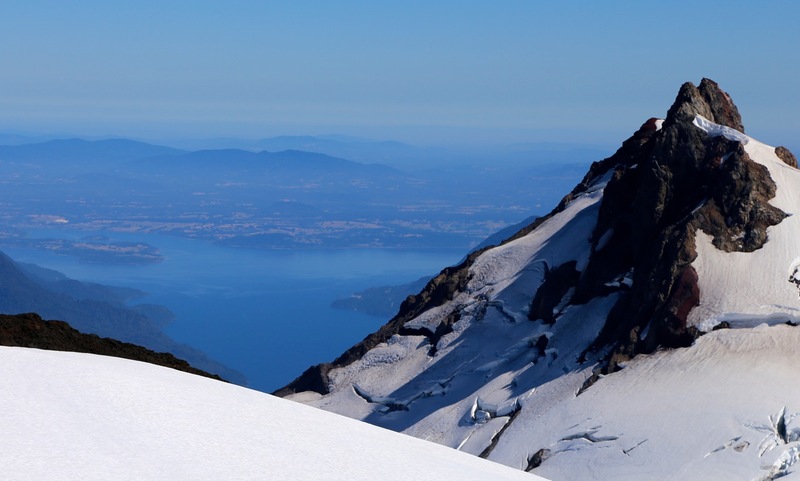 When the slope eases, you are on the small glacier that connects to the mountain. This location is at S39.93919, W072.04646, elevation about 1900 meter. The mountain will now come into view and the rest of the route can be seen. The glacier may have a few crevasses, but they are likely small and poses no problems to parties familiar with glaciers. When looking directly towards the mountain, you will see a shoulder on its left side (on the side towards the very nice looking Choshuenco. 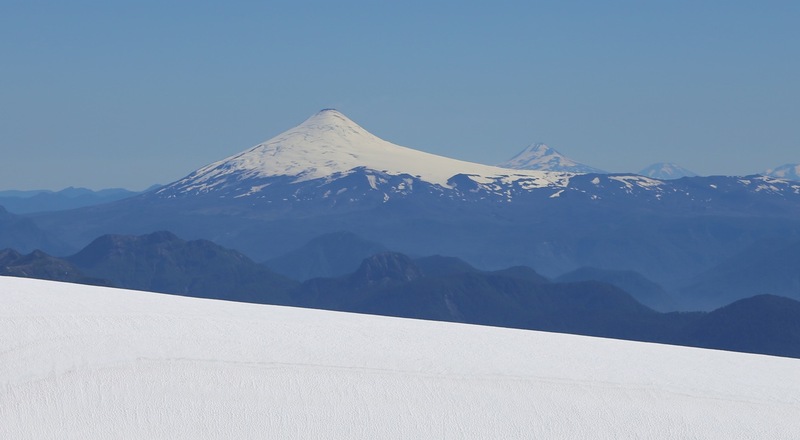 A snow slope runs all the way up from the glacier to this shoulder. 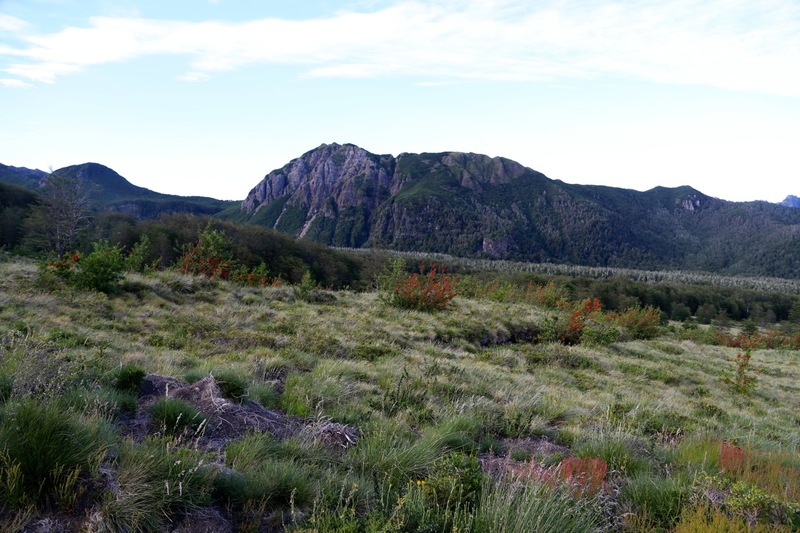 From this shoulder, one can follow pretty easy slopes directly uphill to the crater rim. Thus, first cross the glacier, climbing very gently (almost flat) to the base of the snow slope. Next, ascend this snow slope, mostly on very moderate snow, with perhaps 20 meter of slightly steeper snow near its top, stay to the left side when viewed uphill. On the shoulder, turn right and follow clear tracks from previous ascents as they zig-zag uphill. There are some loose rocks, but mostly this slope is quite stable and pretty easy to climb, nothing steep. 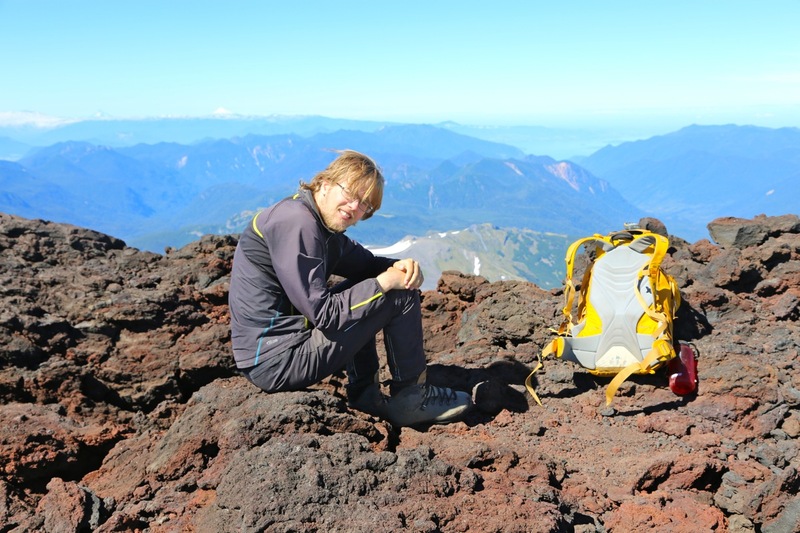 When you reach the crater rim, turn right and walk to the highest point. 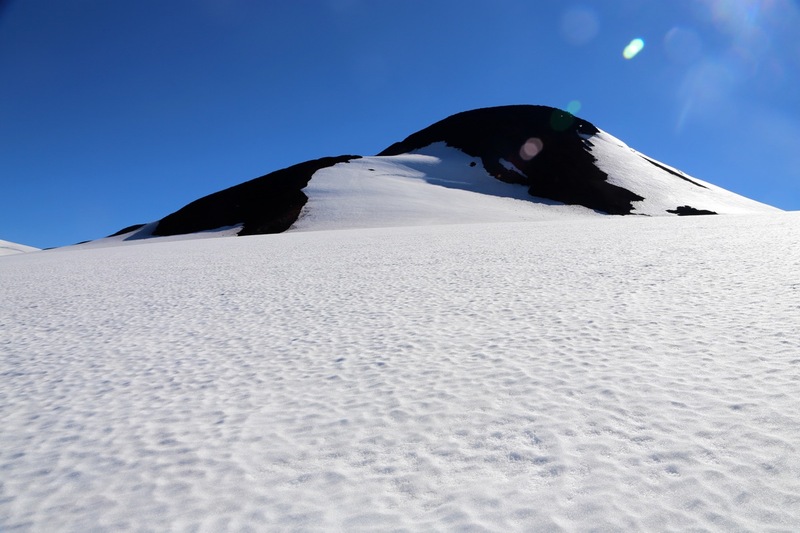 This final section may be slightly easier by just walking across the flat snow in the very shallow crater. We stayed in a small, but nice hostel in the town of Panguipulli. Leaving before daylight, we then drove to the end of the lake and onwards on dirt roads to the bridge just below the Conaf building. We crossed the bridge, then parked at the left side of the road, thinking that the hike would be nice to start from this location. As we prepared for the hike, a Conaf ranger appeared, we therefore visited his building and filled in the visitor registration book. He wanted 4000 pesos for each person for hiking/climbing in the park. We were on our way by 0835 and reached the end of the road in one hour at 0935. 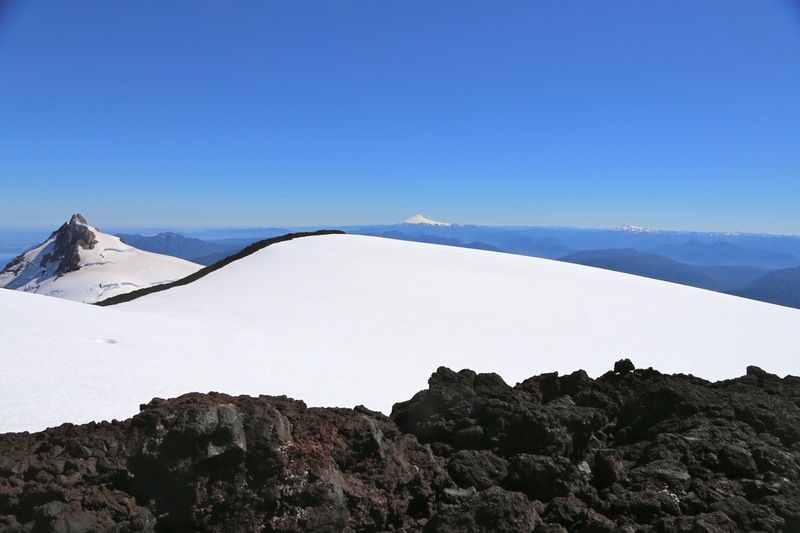 Choshuenco is visible to the left, while El Mocho now is hidden behind the nearby horizon ridge. From here, a nice trail took us onwards along the moraine to the beginning of the snow where we had a short break before continuing up the snow. The weather was very nice and soon, the peak came into view. The slightly lower, but steeper Choshuenco, stood proudly to the left. 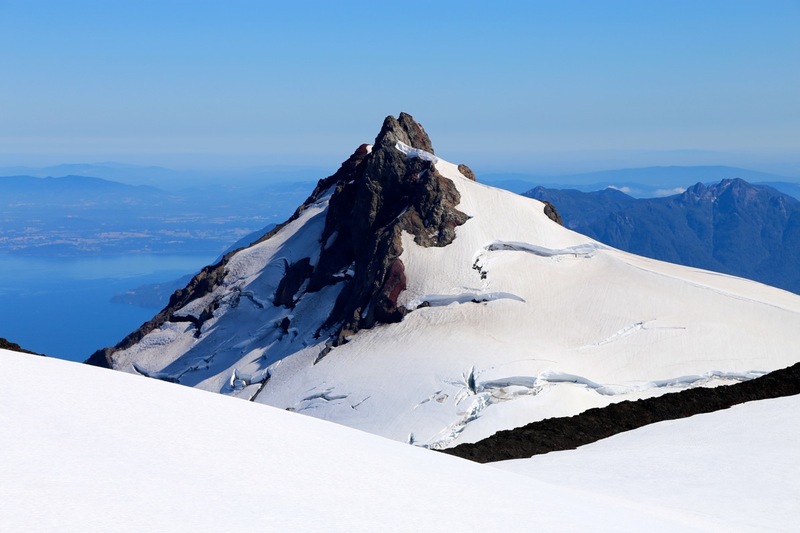 We did notice old tracks in the snow that led across the glacier, but then left of our mountain. This looked consistent with the route described by Rob Woodall (see Peakbagger), from his ascent one year earlier. 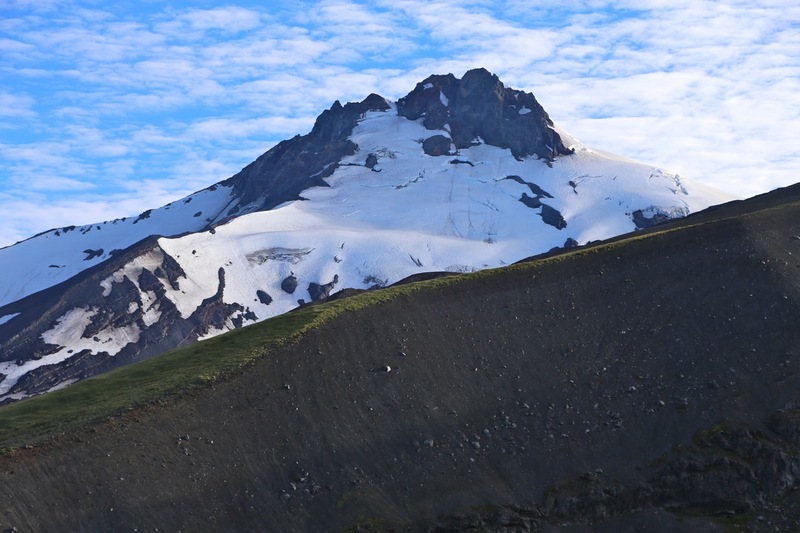 However, it seemed to us that a somewhat more straightforward and possibly easier route would be to just cross the small glacier, then ascend the big snow slope facing us directly ahead to the shoulder. From there, it looked very feasible to ascend directly towards the summit. We saw no reason why this would not work and therefore went ahead despite clear evidence (tracks) showing that people tended to do this climb differently. Our route turned out to be both easy and straightforward. 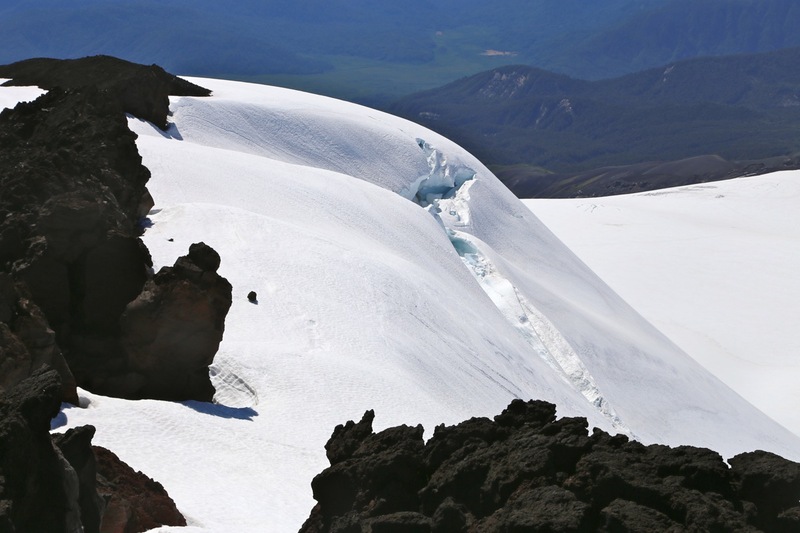 Indeed, clear tracks from the shoulder and up to the crater rim showed that frequently climbers do go this way as well. We arrived at the summit slightly before 1100, that is less than 1:30 from the end of the road. 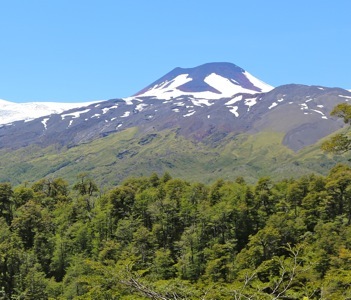 Good views, to nearby Choshuenco, but also north to our previous climb of Villarrica the day before. 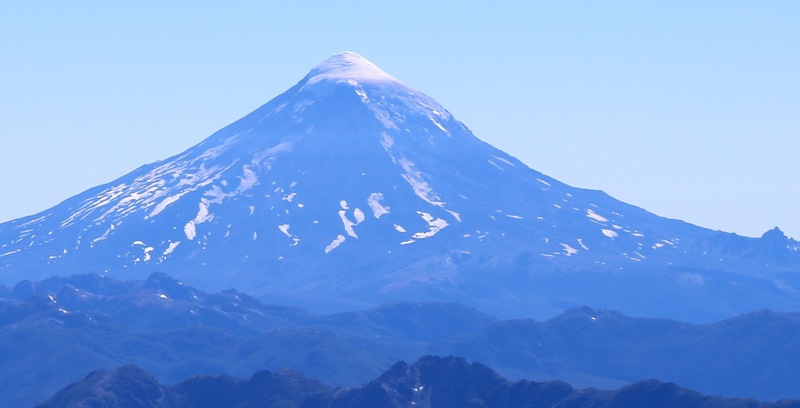 To the south, we could also see Osorno, our next goal, as well as several other peaks, among these the highest peak in this area, Lanin, at 3776 m.
We left around 1115 and were back at the road in a little less than one hour. Quite a large number of annoying flies bothered us on this grassy hill, it was actually nice to descend into the forest section to hike a bit more undisturbed. The road hike required another hour, we were back at our car slightly before 1315. The drive back to Panguipulli went smoothly. The Conaf ranger had advised us that the road going west on the other side of the lago (which looked like a shorter route) could not be driven. We continued south to the tourist town of Puerto Varas, where we establshed a new headquarter for the next 4 nights at hotel Park Inn by Radisson. Choshuenco, as seen from El Mocho. 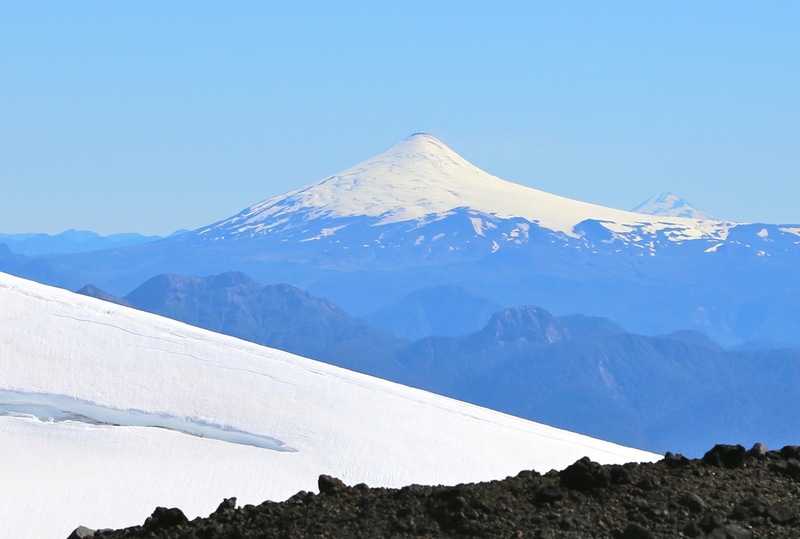 Villarrica, as seen from El Mocho. 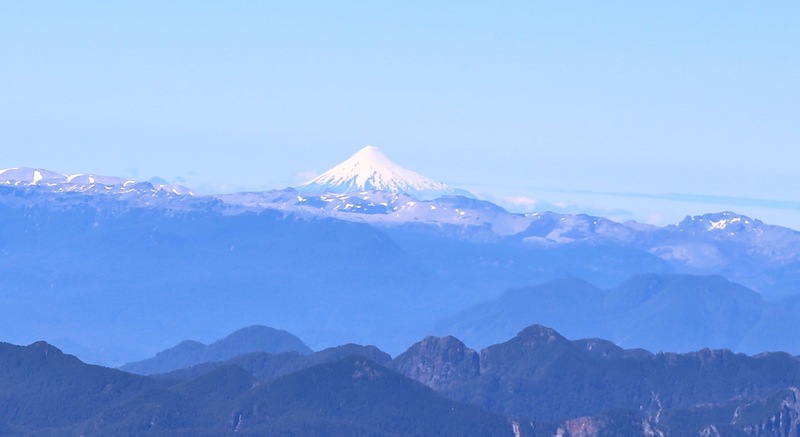 Puntiagudo and Osorno, as seen from El Mocho. 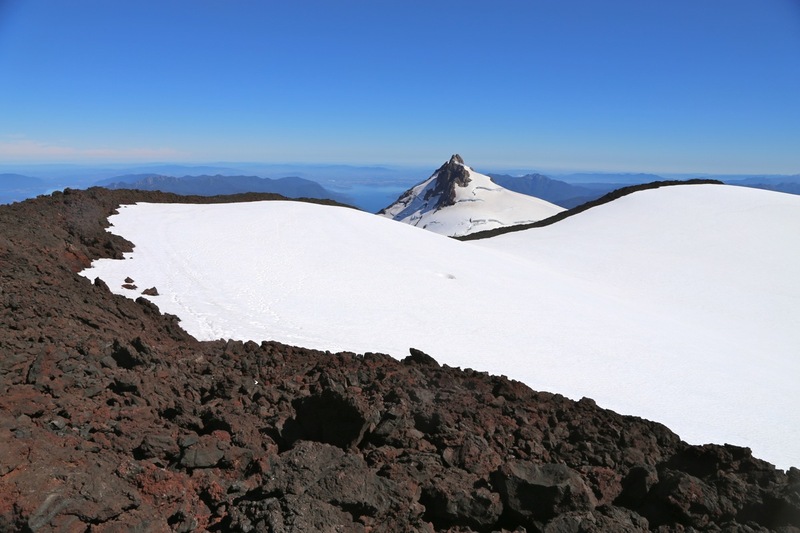 Snow and the crater rim.